I try hard not to call the soup I love to make "kitchen sink soup". It is basically the only soup that I make from scratch. The fact is, that it is so good, there isn't much need to make another kind of soup. It is chicken vegetable soup, but the special thing is that I use so many kinds of fresh veggies. Today I am making soup for 20 people or so for the Lenten Soup Supper at church tonight at 6:30. I made chicken stock yesterday with a whole chicken. George and I had poached chicken for dinner last night with noodles and mixed vegetables. Now, that's comfort food! 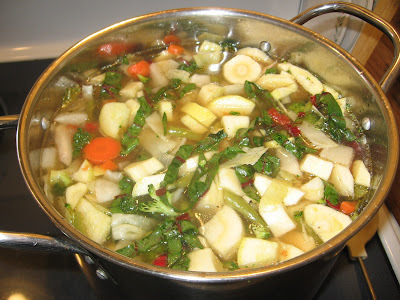 Today I drained the stock and added all the vegetables. The list is long, and it is the reason that this soup is not only my favorite, but very good besides! List: parsnips, carrots, squash, garbanzo beans, green beans, cabbage, carrots, onion, tomatoes with chilis, turnips, broccoli, potatoes and chard. ALL those fresh vegetables (and a small can of diced tomatoes) makes this soup really really healthy and really delicious. I have made it many times in my life, and it just gets better. I am going to serve this soup with Panera bread, whole wheat bread, oyster crackers and corn bread. Brownies will be the dessert. Oh yeah. 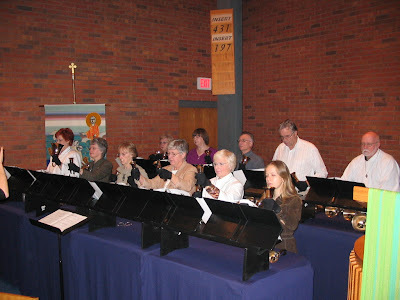 Today our bell choir played during the offering at church. The piece that we played is a level higher than we usually play, and has several chord changes. It was difficult in practice, but this morning at our early rehearsal before church, we played it perfectly and it was beautiful. The director said it was the best we had every played. Quite a compliment. Or a curse. You know what happened. During church, we played it like amateurs. I had one measure where I play four bells with key changes, and somehow, I picked up the wrong bell and played a flat, (boink) and then quickly changed bells, but that chord had changed too, and I played ANOTHER wrong bell. As mistakes go, I guess this is not a large one, but I was sorely disappointed in myself. Those few tricky measures with several chord changes and playing four bells at a time was fun! I love feeling like I know what I am doing. I practiced and got it right during rehearsal until I hardly ever made a mistake. Until we played today. Some of the other bell ringers got lost, and the melody line got lost at one point, and I just kept counting and ringing until the others found their place. I didn't get lost, but it a long way from our best performance. I guess it wasn't awful...and people said they liked it, but none of us wanted to talk about it afterward. It was such a pretty and challenging piece and we tried so HARD! We didn't have to stop and start all over at least. But we wished we could have. Have a great and peaceful Sunday. Every day I hear ads for cell phones and computers that advertise that you need this product so you can record and share music with your friends. That is a concept that is totally foreign to me. I thought the reason we have IPODS and head phones is that we DON'T have to share music with anyone...we can listen to what we like all by ourselves. Marching along to the tune of our own drummers is the point, I thought. 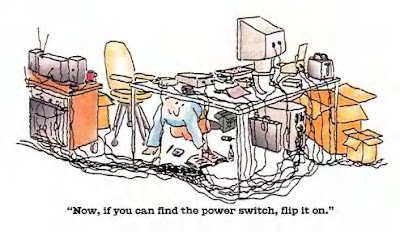 Connectivity seems to be what companies are selling...ways in which we can use technology to share with others what used to make us happy to have all by ourselves. I think that technology is the horse that has gotten out of the barn. Now we have to catch it and see how we can sell it. Surfing the net, watching movies, TV, and sharing music through my cell phone is just a concept that I don't understand. I don't even like it much when the darn thing rings! I can never imagine wanting to share my music with with my friends on my cell phone , saying to George, "Hey, listen to this." It must be a teen thing. Just another way to have something to talk about? Or just another way for a company to sell something more that mom and dad will have to pay for. Dell's TV ads say that with the new Vista operating system and their new computer you can watch TV, movies and "share music" with your friends. No thanks. Underneath all the buzz about Vista operating system is that everyone who wants to use it will need a new computer. Do I sound out of it? Probably. No problems? Let's make some. Yesterday I ran an errand to the post office, and decided to stop in at The Christmas Tree Shop to see if they had any containers to use for beads to help organize my jewelry studio. I'm always looking for new ways to organize beads! 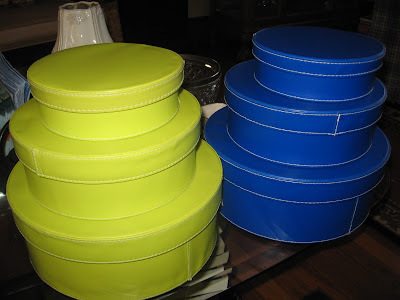 I found some really nice round nesting boxes which I can use for jewelry. I pack jewelry items in these to take to shows, and then use the boxes themselves as display pieces sometimes. I also use them to organize silver and beads. Anyway, I had a fine time looking at all the things they have at the Christmas Tree Shop. It is a big import store and you can never tell what you will find there at very reasonable prices. I don't go there often so I enjoyed looking at all kinds of stuff. On my way out the door I took my keys out of my purse, put my purse and the bags full of boxes into the cart, and wheeled it all outside. I parked the cart by the outside door, put everything into my car, and drove off down busy Route 1. About 10 miles down the road, and almost home, I looked into the seat of my car and saw that my purse was not there. I quickly realized (with HORROR) that I had left my purse in the cart baby seat right outside the store. I managed a quick turn around in someone's driveway, and headed back to Route One, which is a very busy local highway that is a long divided highway. I had to go all the way back, then continue on to the turn-around in a U-turn lane, and then ALL the way back to the store. I was praying that whole time that the nice ladies shopping behind me would find it and turn it in. It was not a busy day at the store, I told myself. The people who shop there are all nice people, I told myself. I prayed. I tried to drive carefully but quickly, since now I was without a driver's license. I tried not to think what would happen if all my credit cards and drivers license were missing. I realized that I carry too many credit cards with me and vowed to change that in the future. I prayed some more. At the store I had to wait for the service person to get off the phone. I didn't see my purse at her desk anywhere. When I finally got to tell her why I was there she asked my name. "Oh, yes, we have your handbag at counter 23", she said. She called the manager. WOOHOO!!! They asked me to show my driver's license for ID and out I walked. Indeed, it was one of the very nice ladies behind me who had turned it in. I was very relieved I might say. Thank you again to the angels who follow me around and make things ok again when I do stupid stuff. My friend sent me this picture from New Orleans. It is a REAL picture from yesterday! On Thursday I had an attack of food poisoning. It took all this time to get that poison out of my body. Saturday I thought I was better, and I was able to go out to dinner on Saturday night with no ill effects. However, I was not feeling well on Sunday, although I limped through church and Sunday School, and on Monday I was positively worse. I was going to call the doctor this morning, thinking that maybe I had the flu after all...but today I am back to my old peppy self. Emphasis on old--but peppy too. Anyway, I think my bout with food poisoning is finally over. I was sicker than I thought I was. On to new things. Today I am playing catchup--which reminds me of a story. When I started teaching Sunday School about a year ago, I realized two things: I needed a way to make sure I could keep chaos under control and I needed to get to know the kids better. So, I made only one rule for the kids, and only one. It is a rule that I only have to remind them of rarely: no interruptions. This means when I am talking, there is quiet enough to listen, and when they are talking, we can be polite and really listen to what each of us has to say. That one rule has worked wonders on my ability to have control in the class and to keep the noise and rambunctiousness to an acceptable level. I don't ask for perfection. They know that. In order to get to know each other better, I start each class with about 10 minutes of "Catch-up time". We go around the table and talk about our week. One at a time the kids talk about their week; about tests at school, hockey games, gymnastics competitions, birthday parties, new baby sisters or brothers...on and on. They really look forward to this time. THEY LOVE having people listen to them! It is fun to learn about what their week was like, and it is a great bonding exercise. One of the assistant teachers came in to help last Sunday and he said, "What a nice group of friends." That made my day. They ARE friends--because we have learned to LISTEN to each other! What a gift! I don't want Sunday School to be like weekday school. I want it to be a little more open, and a lot more friendly, and I want them to WANT to be there. This is probably the only time of the week where they can talk about Jesus, and read the Bible. Their lives are packed with so many activities it is amazing. We do a lot of Bible reading, and digging for meaning, and talking about history, geography and what life might have been like in Biblical times. It is fun, and they are very smart. It is challenging to find material that is good enough to keep their interest. I work during the week to prepare for the class and put together readings and activities that they will enjoy. We learn together. And every Sunday there they are sitting at the table at 11:00 sharp waiting for me. I barely have time to get a cup of coffee after church. They are eager for Sunday School. Sometimes patience is NOT a virtue! Last night George and his daughter and I went out to dinner. We do not see her often and this was a chance for us to get together. We went to a Thai restaurant in the next town. It is a cute little place, under new management, and I had been there for lunch once a couple of weeks ago and the food was fragrant and delicious. We arrived at 7:15 p.m., along with about five other diners. There were 7 tables in the restaurant and it soon became apparent that one waitress was going to serve everyone, (about 14 people) and we were not even sure that there was anybody at all working in the kitchen. In 10 minutes we had three glasses of water. Then, nothing arrived at all for the next 30 minutes. By this time, all the expectant and dismayed diners were looking askance at each other, maybe wondering who was going to get up and leave first. More than one of us had the idea to storm the kitchen and find out what was going on, but our politeness got the better of us. One table of young people were having a great time and seemed in no way dismayed at the long delay in getting dinner. The rest of us started to sulk and look longingly at the kitchen door each time we heard footsteps. After a full hour we got our bowls of soup, and 30 minutes after that our main dishes arrived. It was 8:50 by the time our dishes had arrived and we were eating dinner. The food was delicious, just like I remembered, but by this time, we were all a little weary of the whole experience. In hindsight, we should have left after 30 minutes when we saw that the restaurant was clearly understaffed. At one point I said that perhaps we should plunk down a $10 bill and leave, paying only for our soups. But, of course, we didn't. We stayed. And stayed. I wanted to order a pot of tea, but was afraid to, thinking that we might not get it until tomorrow! Later, we found out that there was one waitress and one cook. They were cooking the dinners one at a time, and that is how they were served. As one table got served, you could hear the food hit the hot pan in the kitchen for the next order. The food was fresh and fragrant. However, by this time we were tired of the whole experience. We still had a really nice time together, having such a long time to talk, but after we ate we quickly paid the check and left. As I walked out the door into the night air, I was grateful to be out of there and wondering how long it would be before we went back. Probably a long wait. I got sick on Thursday morning and spent the day wishing I wasn't so sick! In the afternoon it hit me...food poisoning. I was so sick! Not much can be worse. I was headachey, with a fever, chills, and all the other dramatic symptoms of food poisoning which I won't go into here. I could barely make it from bathroom to bed, and back again. Wouldn't you know it, last night George had tickets for us to go to a nice dinner, a date, an evening out...and instead he had to go alone to the dinner and presentation about rocket science (no kidding), and I was laying in bed sleeping and sipping Sierra Mist. This morning I was able to get up and drive to the drug store, and later in the day I actually got out to deliver some jewelry. It is very treacherous out there. What looks like a nice four inches of snow is actually pure ice. The cars are all iced in, the driveway is icy and the curbs are a 2 foot barrier of ice. I walked down to the car carefully and slid the last two feet until I was able to grab hold of the car and get in. When I got home, I was wishing that I felt better, so I took my temperature again, and it is 100...just enough to make me feel puny and sickly. No wonder I don't feel like doing anything useful. I poked my nose of the front door today to get the mail from the mail carrier and when the sleet hit my face, I quickly shut the door and didn't open it again today. George came home early and did some shoveling until the snow blower broke. I can hear the sleety icy rain hitting the window as I type. George was cold and wet when he came in, and quickly called the hardware store for snowblower repair. They said, "See you next week." I made pork roast in the slow cooker and worked at my jewelry table most of the day. It was a quiet and safe day and sometimes that is enough. 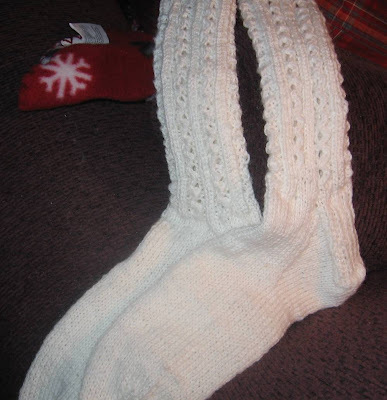 I finished a pair of socks for my mother while we watched two more episodes of "Rome" tonight on DVD. I am really enjoying that too much...and can't wait for the next DVD to arrive. Mom got a nice bouquet of Valentine flowers from me today. 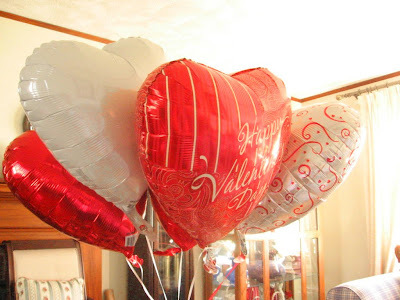 I love my big bouquet of balloons in the living room. My Valentine present from George was some beautiful red cathedral beads and an awesome new Lindstrom jewelry pliers which I am absolutely crazy about. 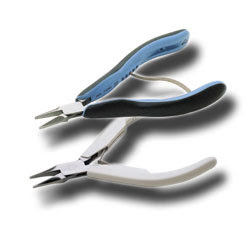 Who needs roses when you can get a beautiful pair of flat nose pliers? George and I had a really busy weekend, but boy did we have fun! On Friday night I had a private jewelry showing for some friends at church, and I had a great time showing everyone what I had made. I set up in the library just like a mini-craft show, and laid out all the sparklies. We all really enjoyed ourselves. My friends were a very good audience and good customers too! I have some work to do this week to resize things and make some of their creative ideas for new jewelry come true, so I'm going to be in the bead studio for a few hours this week making it happen. On Saturday George and I shopped for things for the chocolate fountain. I made a necklace as a gift in the morning and mailed it off by noon while George made the rice crispy bars for dipping. The Hearts Party was a big success, with four tables of card players and a very successful chocolate fountain. The chocolate flowed freely, and all the snacks were tasty. We used up six bags of chocolate in the fountain and threw about four bags worth of chocolate mixed with oil away at the end of the evening, because that is the way chocolate fountains work...a lot of waste...but...it was a hit! The only downside was that we forgot to take the rice crispy bars, but they weren't missed. Sunday I had 11 energetic kids in my Sunday school classroom, and we made valentines to give to our families and learned about the Prodigal Son. Sunday afternoon was a huge event...a jewelry class with someone who I really admire and who makes really beautiful jewelry...and I made this! A new necklace that is a complete departure from what I usually do. It was a lot of fun to work with someone else's inspiration, and then add my own touches. I finished the necklace this morning with all the tiny wire wrapped shell beads and crystals. I do best when I learn by taking a class. 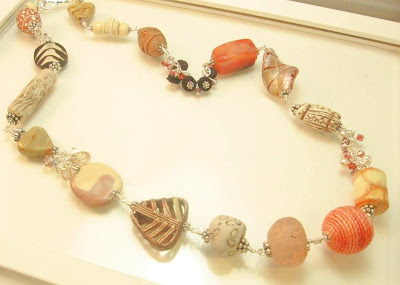 It is worth the money for me to have the beads chosen, a successful project assured, and to meet new people who love to make jewelry as much as I do. It was an exciting afternoon and I can't wait to wear the necklace. Last night we watched three episodes of Rome, the best TV Show ever, shown only on HBO, which we do not have. So we signed up for Netflix so we could order the disks and see lots of other great movies besides. Popcorn! It was a wonderful weekend, and I have a great new necklace to wear. Nice! Tonight is the annual Hearts Card Party at church that George and I host each year. We bring the tablecloths, napkins and cups, and provide sodas and coffee and everyone else brings a snack or a dessert to share. The food is really good, but the real fun is sitting down to play Hearts with about 30 of your friends. We all bring card tables and chairs. The "price of admission" is a package of new socks for the homeless shelter. This year we are bringing the chocolate fountain from Mike and Michelle's wedding. I went to the party store and bought six bags of chocolate wafers. I sure do hope that the lady was right and that this is what we need. I have no idea how to make a chocolate fountain work....but we are sure going to try. We have hosted this party for the past five years and it has been going on annually for a lot longer than that. It is usually the same people who show up, and it is a lot of fun. If you don't know how to play, we teach you, so every once in awhile we get a newbie. At the end of the evening, we tally up the lowest scores and crown a King and Queen of Hearts, who are presented with the Hearts Party mug and a foil crown, which they wear at church the following morning. It is a fun night and I'm looking forward to it! We have a big house and when it is this cold getting the inside temperature just right isn't easy. Our house thermostat is wired so that the furnace is off during the day and comes on at 5. If I am home during the day, the house gets really really cold. I hate to have the furnace cranking away heating up ALL those radiators just for little ol' me. 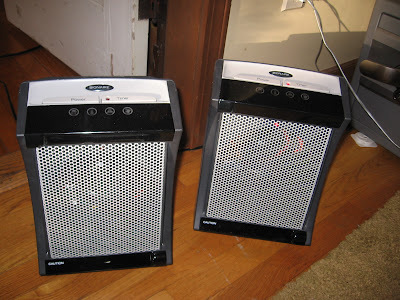 So, we bought a Bionaire heater. The thing is incredible. I use it in the den, and that room gets toasty warm in minutes. I loved it so much I had George go out and buy another one. I have them sitting side by side, and travel in the house with a heater under my arm ready to be plugged in when I need it. Then, George found another little heater on sale for $13. It is cute. My idea was to use it at my beading studio in the kitchen. The first time I turned it on it blew a fuse. I traveled down to the fuse box in the basement, hitting my head on the overhead pipe, and figured out how to fix the fuse. I'm not very fuse-box savvy. I went back upstairs, turned off the coffee pot, and a few lamps, and turned the little heater on again. The fuse blew again. So, now I have a little heater in the kitchen that I am afraid to use. Even when I do have it working, it goes on and off endlessly, which isn't exactly what you want. I guess you get what you pay for. But I'm not ready to take that little heater back to the store yet. I've bonded with it. It is my little heater and I'm sticking to it! Cold will do that to you. Super Bowls are highly overrated I think. This year I was not very interested, and it seemed to me that no how hard I rooted for the underdog (da Bears), the other team (the Colts) were going to win. I'm not a big Payton Manning fan ever since I used to watch him play for the University of Tennessee where the only thing that matched his ego was the size of the stadium. So, yesterday, during the Super bowl, there was a marathon knitting show on the DIY Channel (Do It Yourself) which was awesome! I love to watch knitting shows on TV and God Bless the DIY cable channel for putting on true giants in the field like Lily Chin. 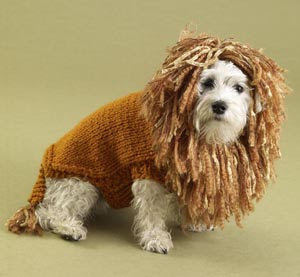 She knows more in her little finger than I will ever learn, and I have earned the title "advanced" knitter. I can now knit the hard stuff and Lily Chin makes the hard stuff look easy. 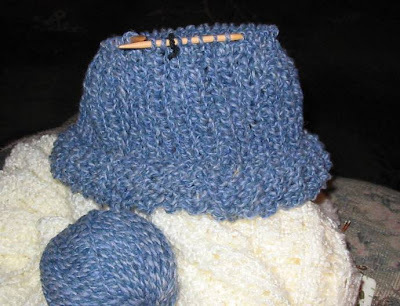 So, back and forth we switched, knitting to football and back again. George didn't seem to mind. We are Patriots fans. 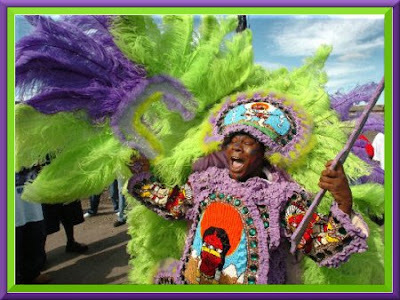 We are going to a Mexican "Tables of Grace" dinner on Saturday night. These fellowship dinners for a dozen or so people are hosted by church members in their homes and this dinner is going to take place in the parlor at church where there will be plenty of room for everyone and a place for the children to play. We are looking forward to it. I'm sure the hostesses will have the room decorated and all the food will be yummy and the company very fun indeed. We all have been asked to bring something Mexican-themed, and I said I would bring enchiladas and a cake. Martha Stewart's recipe for enchiladas looks as good as anyone else's so I plan to bring a nice flat casserole dish full of cheesy beef enchiladas. Sounds good to me. They look as simple as anything Martha Stewart can be. The thought process around the cake is a little more complicated. I found a nice recipe for Maple Cake which sounds like it would be good--but I have never made it. George hates coconut, so that's out. I would make a lemon curd cake, but that is a little harder, and smaller, and may not feed the right number of people. I am not in the mood for chocolate. I thought about staying true Mexican and bringing Flan, but that is too hard to make, and the children won't like the burnt caramel taste. So, I am going to keep it simple. 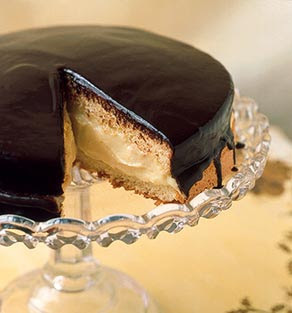 I have decided to bring a store bought Boston Creme Pie. No one makes Boston Creme Pie like Bostonian bakeries and theirs is just as good, if not better, than anything I could make homemade. I'm pretty sure that if I made two large layers of yellow cake and put a creamy custard filling in between, the two layers would slide apart and end up lying side by side on the kitchen counter. Sometimes we do have to learn from mistakes we haven't made yet! George loves Boston Creme Pie, and I don't remember ever having it until I moved to Boston. It is George's favorite treat for his birthday, so...I don't bake many birthday cakes either! So, Mexican Cream Pie it is. I'm sure it will all be delicious.